Microsoft (Nasdaq: MSFT) CEO Steve Ballmer recently sat down for an interview with The Seattle Times, discussing major strategic directions for the company ranging from its competition with Amazon.com (Nasdaq: AMZN), Apple (Nasdaq: AAPL), and Google (Nasdaq: GOOG), as well as the software giant’s broader future. Here are some highlights, as well as this Fool’s take on how investors can interpret Ballmer’s perspective. Ballmer thinks the potential of Windows 8 is on par with Windows 95, one of the most important software releases in the past two decades. He even thinks Windows 8 will surpass it, and while that’s a tall order to fill when you consider such historic milestones, the new OS is “at that scale,” according to Ballmer. Windows 8 is at the heart of why virtually all of Microsoft’s product lines are getting major overhauls this year, including Windows Phone and its other primary cash cow, Office. The entire company has been realigning its goals and time frames for the new platform. He talked about how massive the PC market is in an attempt to downplay recent talk that the PC market is languishing, with next year’s units estimated near 400 million, “which makes it a big market.” This is a misguided perspective, though. If there’s one thing that investors crave, it’s growth. Being “big” alone simply doesn’t cut it, since companies are valued based on the merits of future cash flows, and companies as large as Microsoft have large growth needs. 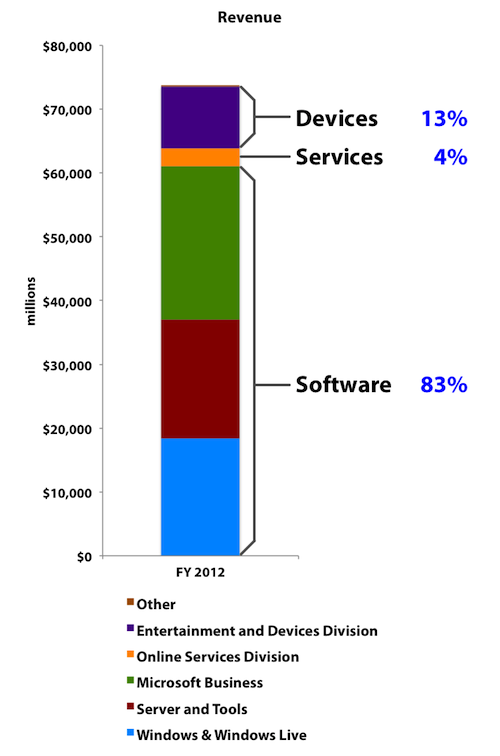 For example, last year Microsoft booked US$73.7 billion in revenue, posting 5% year over year growth. If the company were to theoretically post sales of US$66.4 billion in sales next year — “big” without a doubt — that would still be a 10% decline and you can sure bet that investors wouldn’t be too pleased with that result, “big” or otherwise. PC OEM license units actually fell 1% last year. Researcher IDC estimates 2012 PC shipments will end up around 367 million, so 400 million units would be 9% growth if Ballmer’s predictions turn out accurate, which is in the ballpark of IDC’s estimates for 391 million units in 2013. I think most people would tell you that the iPad is not a super-expensive device. … (When) people offer cheaper, they do less. They look less good, they’re chintzier, they’re cheaper. If you say to somebody, would you use one of the 7-inch tablets, would somebody ever use a Kindle [Fire] to do their homework? The answer is no; you never would. It’s just not a good enough product. As the de facto standard in the tablet market that all competitors are compared against, pricing above the iPad would be a terrible mistake. 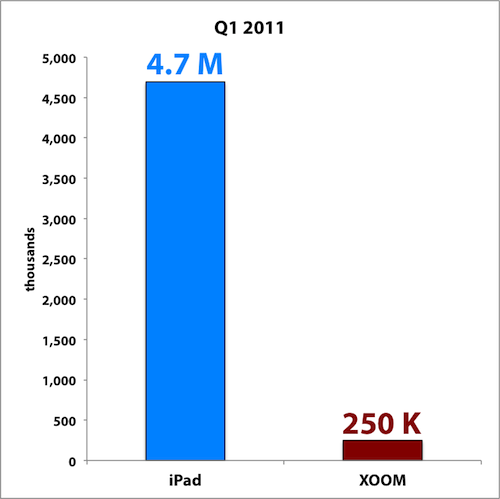 Just ask Motorola, now a Google subsidiary, how its original Android-powered Xoom fared when it launched at US$799 in Q1 2011, a 60% premium relative to the entry-level US$499 iPad at the time. Actually, I’ll save you the trouble. Sources: Apple and Motorola. Calendar quarter shown. No competitor has performed well when pricing above, while some are seeing success below, notably Amazon’s Kindle Fire and Google’s Nexus 7. Surface needs to be at or below iPad pricing. First of all, I’d say: pre-eminent technology company. I think that in a back-looking view, people would say we were a software company. That’s kind of how we were born. Ballmer is quick to point out that this doesn’t entail making every device — a clear nod toward its hardware OEM partners — but clearly Microsoft has more first-party hardware offerings in mind. “A little different” is perhaps the biggest understatement of the century. Saying that Microsoft will be more of a “devices-and-services company” is actually an enormous transition. Of course there will be software underpinning every offering, but here’s how I would categorize its existing operating segments. I will give Microsoft credit in a critical aspect, though. Windows 8 truly is innovative in many respects, so much so that it’s a major risk to Microsoft’s business. But that may very well pay off in spades and the rewards could be commensurate with the risk. No company ever gets anywhere without taking big risks, and Windows 8 is the biggest Microsoft has taken in years. Compare that to some of Apple’s product launches this year, which are primarily focused on incremental upgrades instead of revolutionary ones. But from Apple’s perspective, why risk it? “If it ain’t broke…” they say. Apple’s still riding high on its last big risk and revolutionary product, the iPad, so it’s under less pressure to reinvent any more wheels anytime soon, unlike Microsoft. For Microsoft, I don’t think there will be any middle ground for Windows 8. It will either be a dismal failure or a blowout success. The next year will tell which.